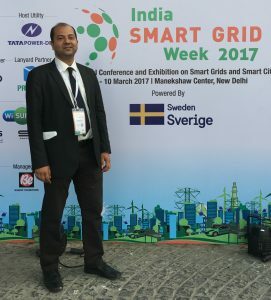 Affectus AB participated in the India Smart Grid Week held in New Delhi at the prestigious Maneckshaw Centre! It is one of the most prestigious events in the spectrum of Renewable Energy! The dignitaties from different countries were present on the occsasion! Mr Reji Pillai; the president of the ISGF initiated the start of the occasion! Mr Harald Sandberg; Ambassador of Sweden to India was present & inaugurated the Swedish pavilion! Affectus AB with the determination of playing an active part in making the Green World was an integral part of the Pavilion was represented by Anandam Sanyal; in charge of the emerging markets of India & South East Asia!! Along with the renowned companies like ABB; Ericsson; Metrum; Teroc etc! There were discussions based on the concept of Renewable energy and its’ use! The probable application to the various sectors & sections of industries where power is a determinant factor for instance E- mobility; Solar Power use; Smart Metering! We discussed with all the exhibitors our system related to data; measurement systems; Smart metering integration with existing etc etc! We were delighted to know that the concept of using Affectus systems was accepted by one & all! Smartness is nothing but when an idea is implemented & sustainability is when the idea performs constatntly with the scope of innovation!! Affectus is catering the smartest brains to think smarter and optimizing the Sustainability to the sensational ideas!! Connect with us to give your brilliant ideas a sustainable future. . . . . .